How easy is it for ordinary citizens to secretly record FBI phone calls? What horrible, terrible things might happen if you ignore that pop-up notification on your Mac, iPad or iPhone? Can you get Windows 8 for free now? And are there any good movies playing on the Moon? Get answers to these burning questions, and the scoop on the latest tech news, in this edition of the Geekly Update. It's guaranteed to make you 146% smarter. Read, think and comment! Spying on the spies? Is the government listening to your phone calls? Who cares, when it's so easy to listen in on THEIR conversations? 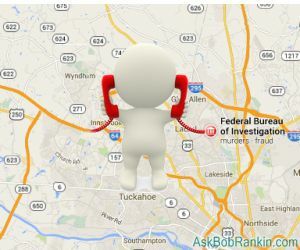 A clever network engineer recently demonstrated how he intercepted FBI and Secret Service phone calls, by entering bogus information into Google Maps. I hope that guy has a big life insurance policy. Apple acknowledged a major security flaw in its SSL security implementation that leaves some data unencrypted that should be encrypted. The bottom line: ANYTHING you send or receive over the Internet could be seen, modified or deleted by "man in the middle" attacks. All unpatched iPhones and Mac computers running OS X are affected. But the company’s announcement was so low-key that many users may have overlooked or ignored the notification instructing them to download and install the patch. Don’t skip this important step. Comcast customers will enjoy smooth Netflix streaming again thanks to an agreement worked out between the companies. Verizon is also negotiating with Netflix to deliver better service, in the wake of stories revealing that Netflix traffic was being throttled. Such agreements generally involve one party paying the other. So Netflix may be hiking prices in the future. Mike Parker, who helped create the Helvetica font, passed away at age 84. The perpetrator of Comic Sans still lives, rumor has it. The universe is unfair. Opera, the Web browser that comes after the Big Three, has been quietly remaking itself for the past few years. Most recently, it opened public beta testing of Opera Max, a browser that compresses video, photos, and text before transmission to save bandwidth and data volume. That can be a big boon for mobile users. The Moon has a better Internet connection than you do. NASA and the MIT Lincoln Lab teamed up to put a laser-based communication system on the Moon. It can transmit an HD movie to Earth and back in just seven seconds, while you’re still waiting for Netflix to stop buffering and play video. Microsoft is rumored to be “experimenting” with a free version of Windows 8, hoping “no cost” will boost consumer acceptance while ignoring the cost of people’s time and elevated blood pressure. Meanwhile, Microsoft is promising a Win 8 update that will make it more accommodating of mouse and keyboard users. Maybe the world doesn’t need another mobile operating system, but a $25 smartphone just might find a market. Mozilla is pushing Firefox OS and a $25 reference phone through several OEMs. Whatever happened to the Great IP Address Shortage of 2011? The push was on to get everyone switched over to IPv6 before we ran out of IPv4 addresses. Well, the last IPv4 addresses will probably be claimed by ISPs in 2014, and they will assign them to clients relatively soon thereafter. But still, many creative ways of managing IP addresses will keep IPv4 going for a long time. The Talkband “smartband” not only tracks your fitness and health statistics, it includes a pop-out headset that lets you call your friends and bore them to tears with your pulse and respiration rates. Most recent comments on "Geekly Update - 05 March 2014"
Comic is my favourite font. What's not to like? Comic Sans is a wonderfully 'relaxed' font with a sense of fun and the one I turn to most for creative projects. Well done Universe - we need variety. ... but there's NOTHING on there about intercepting FBI and Secret Service phone calls. Why does Comic Sans get such a bad rap? I use it for many different aspects of my digital life. It's very simple and readable and fun and gives you a sense of calm ~ IMHO. It's funny how certain things on the Net get a bad reputation. But i've yet to see a logical explanation for this. Anyone have a theory?